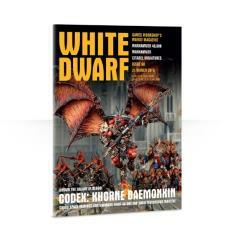 #60 "Codex - Khorne Daemonkin"
White Dwarf 60 arrives to drown the galaxy in blood! This issue sees the release of Codex: Khorne Daemonkin and we’ve got the lowdown on these most blood-crazed of all the followers of Khorne. And if you’ve been waiting for the fantastic new Bloodthirster to make his Warhammer 40,000 bow, this has got everything you need – exclusive datasheets allowing you to use the three mighty new Bloodthirsters in your Chaos Daemons army. This and still yet more – grab one now.